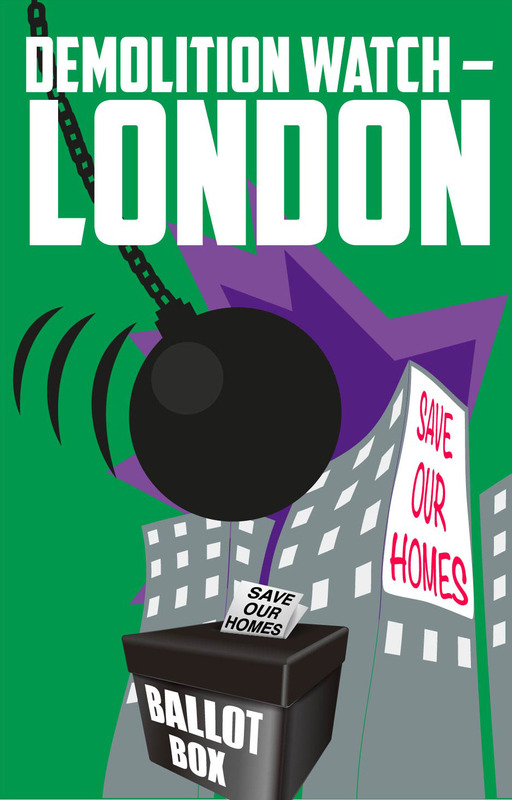 We call on Sadiq Khan, London Mayor, to require that regeneration takes place ONLY when there is resident support. Councils must BALLOT their residents, ensuring everyone gets a VOTE in the future of their home. No Demolition Without Resident's Permission. 2. Ensure the use of BALLOTS to let estate all residents decide on the future of their homes. 3. Require a genuinely fair deal for all displaced residentsMake the changes we have set out below to his draft ‘Good Practice Guide to Estate Regeneration'. Are environmentally wasteful and unnecessary. Do not have the support of a majority of residents who are displaced. Leave displaced households worse off than they were before the demolition. Result in a net loss of desperately needed homes at council rents. Provide poor value for money for the taxpayer. What's Wrong with the Good Practice Guide to Estate Regeneration? 1. Make it clear in the main body of the guidance that estate demolition schemes will not be approved by the Mayor to go ahead without resident support, based on full and transparent consultation of all residents, whatever tenure. 2. Remove on page 19 the caution against using ballots or votes to assess the acceptability of proposals. This caution is ill-informed, contrary to the evidence and conflates the issues: if necessary, ballots or votes can be repeated as proposals develop. 3. Require that all residents who would be displaced by a demolition scheme are given a balloted vote to have the final say on whether it should proceed. Or at least encourage the use of ballots or votes as part of best practice, to ensure that a demolition scheme has the permission of affected residents. 4. Amend in Paragraph 10 the following qualification to the principle that there should be no loss of social housing: “This principle will apply to estate regeneration projects that seek new funding from the GLA.” This principle should be a condition of approval for all schemes that the Mayor has jurisdiction over. 5. The right of return for tenants and owner occupiers must be meaningful. Paragraph 50 should clarify that “Landlords must offer tenants who have to move off the estate while works are underway a full right to return to a property of a suitable size, at the same or similar level of rent, service charge and council tax, the same level of security of tenure and with the appropriate design features.” The Mayor must put in place provisions to enforce this principle. 6. It is common for large scale demolition schemes to last for ten years or more. Under ‘Short Term/ Temporary Tenancies’ there should be a provision whereby, after a certain period of time (e.g. Five years) temporary tenants are granted the same rights to return under the demolition scheme as council tenants, to encourage new residents to put down roots in the community. 7. Independent Tenants and Residents Advisers should be independently funded by the Mayor and residents should have the right to select or deselect them. a. Open book viability calculations for all options, including refurbishment and infill. c. The compensation deal for residents. Fifty estates with over 30,000 homes have undergone regeneration schemes in the past decade. While the total number of homes on those estates has doubled, there has been a net loss of over 8000 socially rented homes. 13% of planning approvals in 2015/16 were affordable homes.